5G is driving up demand for both 300mm and 200mm capacity. Both are in short supply. Several foundries are expanding their fab capacities for RF SOI processes amid huge demand and shortages of this technology for smartphones. A number of foundries are increasing their 200mm RF SOI fab capacities to meet soaring demand. Then, GlobalFoundries, TowerJazz, TSMC and UMC are expanding or bringing up RF SOI processes in 300mm fabs in an apparent race to garner the first wave of RF business for 5G, the next-generation wireless standard. RF SOI is a specialized process used to make select RF chips, such as switch devices and antenna tuners, for smartphones and other products. RF SOI is the RF version of silicon-on-insulator (SOI) technology, which is different than fully-depleted SOI (FD-SOI) for digital chips. There are several dynamics at play with RF SOI. In simple terms, the number of frequency bands has increased in wireless networks. So OEMs must add more RF components, such as RF switches based on RF SOI, in smartphones to deal with the complexity of these bands as well as other issues. This, in turn, is causing greater-than-expected demand for many RF chips, particularly those based on RF SOI processes. In fact, demand is outstripping supply in the entire RF SOI supply chain, causing shortages on several fronts. • RF SOI starts off with the production of 200mm or 300mm substrates from Soitec and others. But suppliers can’t keep up with 200mm substrate demand and 300mm capacity is limited. • Soitec and others sell RF SOI substrates to foundries, which process them into RF chips. Foundry vendors have 200mm RF SOI capacity, but they still can’t keep pace with demand. • Several foundries are ramping up 300mm RF SOI, but capacity is limited. Some 5% of the world’s RF SOI capacity is on 300mm, but that should increase to 20% by 2019. In total, the industry is projected to ship 1.5 million to 1.6 million 200mm-equivalent RF SOI wafers in 2018, up 15% to 20% over 2017, according to Soitec. Around 2020, that figure is projected to exceed 2 million wafers. Where does RF SOI fit? Chips using RF SOI processes are targeted for various applications, but the big market is RF front-end modules in cell phones. In total, Gartner forecasts that worldwide mobile phone shipments will reach 1.9 billion units in 2018, up 1.6% over 2017. In 2019, smartphone sales are on pace to grow at 5%, according to Gartner. RF SOI chips are not the only devices used in phones. A smartphone consists of digital and RF chips. Based on CMOS, the digital part consists of the applications processor and other devices. The RF components are integrated into a RF front-end module, which handles the transmit/receive functions. The front-end module consists of a number of components, including power amplifiers, antenna tuners, low-noise amplifiers (LNAs), filters, and RF switches. Typically, the power amplifier is based on gallium arsenide (GaAs), which is a III-V compound. The power amp provides the power for a signal to reach a destination. LNAs amplify a small signal from the antenna, while filters prevent any unwanted signals from entering the system. LNAs and filters use various processes. Switch chips and tuners, meanwhile, are based on RF SOI. RF switches route signals from one component to another, and tuners help the antenna adjust to any frequency band. For years, the RF content per phone has grown despite a slowdown in smartphones. “In the RF world, the number of bands keep increasing. So our growth rate on the RF side of the house is double-digit territory, while the handset itself is in the single-digit territory,” said Bami Bastani, senior vice president of the RF Business Unit at GlobalFoundries. In wireless systems, radio spectrum is divided into frequency bands. Several years ago, carriers deployed 2G and 3G wireless networks. There were four frequency bands in 2G, and five for 3G. Recently, carriers have deployed a 4G wireless standard called LTE Advanced, which provides faster data rates in smartphones. It has also created band fragmentation in the cellular world. Many countries have allocated their own spectrum, so LTE now works across different frequencies in various nations. In fact, today’s 4G wireless networks consist of more than 40 frequency bands. 4G not only incorporates the 2G and 3G bands, but also a number of 4G bands. In addition, mobile operators have deployed a technology called carrier aggregation. “That means you put these bands together, so you can have more download capabilities. That’s also one reason why the number of bands are going up, because you aggregate them,” Bastani explained. The growing number of bands, coupled with carrier aggregation, has impacted the RF market. First, the RF content per phone is increasing due to the sheer number of frequency bands. In 2000, the RF content in a cell-phone was $2. In comparison, today’s smartphones have between $12 to $15 of RF content per phone with the first wave of 5G smartphones moving to $18 to over $20 per unit. Generally, today’s LTE phones have two antennas—main and diversity. The main antenna is used for transmit/receive functions. A diversity antenna boosts the downlink data rates in phones. Fig. 3: A 4G front end. Source: GlobalFoundries, “Designing Next-Gen Cellular and Wi-Fi Switches Using RF SOI,” Technology, May 2016. Then the signal moves into a series of RF switches. A smartphone might incorporate more than 10 RF switch devices. These devices switch the signal to appropriate bands. From there, the signal moves into a filter, followed by the power amp. All of this adds up to major challenges for cell phone OEMs. Power consumption and size are critical, which is why OEMs want RF switches with no insertion loss and good isolation. Insertion loss involves the loss of signal power. If the switch doesn’t have good isolation, the system could encounter interference. All told, the complexity of the smartphone is driving the demand for RF components, particularly switches and tuners. “Demand is driven by the increased content of RF switches in handsets and IoT devices, which are predominately built in RF SOI,” said Marco Racanelli, senior vice president and general manager of the RF/High Performance Analog Business Unit at TowerJazz. Keeping track of the RF supply chain is another challenge. For example, the power amplifiers are produced by a select group of GaAs suppliers. These and other vendors also design other types of RF devices. Many of them use traditional RF CMOS processes, and not RF SOI. Generally, though, RF switches and antenna tuners are based on RF SOI. In many cases, these chips are made by foundries. RF SOI starts out with the production of a specialized high-resistivity substrate. In the substrate, a trap-rich layer is sandwiched between the wafer and a buried oxide layer. The trap-rich layer recovers the high-resistivity properties in the substrate, which reduces the insertion losses and boosts the linearity in systems. Soitec is the largest supplier of RF SOI substrates with 70% market share. Soitec produces 200mm and 300mm RF SOI substrates. Two other suppliers, Shin-Etsu and GlobalWafers, also produce 200mm and 300mm RF SOI substrates based on Soitec’s technology. (GlobalWafers and Soitec share a cross-license to one another’s patents relating to SOI, so Soitec also produces SOI substrates under license from GlobalWafers). In addition, China’s Simgui produces 200mm RF SOI substrates. Still, foundries want more 300mm RF SOI substrate capacity sooner than later. Substrate suppliers are willing to add more capacity, but only if there is more demand and the industry is willing to help fund it, analysts said. So for the time being, 300mm substrate supply is limited. On top of that, prices for the technology are in the range of 2.7 to 3 times more expensive than 200mm, which is higher than average for 300mm. Many cost-sensitive customers, though, want 300mm RF SOI substrates that are cost-comparable to 200mm. So many customers might be reluctant to migrate faster toward 300mm, at least in the near term, analysts said. At some point, the industry may need to re-examine the supply chain. “The opportunity is there for the industry to grow the business and support the demands of the market. The model of how the whole supply chain gets there is something that’s being worked out,” Ng said. Once the RF SOI substrates are made, they are shipped to the foundries, which process them into RF switch chips, antennae tuners and other products for customers. In the fab, RF switches and antennae tuners are built using conventional CMOS processes. The chips are processed using traditional etch, deposition, lithography and other steps. For today’s phones, RF SOI chips are made in 200mm fabs. In fact, the vast majority of RF switches and other products will remain in 200mm. “Today, the majority of RF SOI is on 8-inch. RF SOI, which is running on 180nm, is moving to 130nm and 110nm. Some of it has moved to 12-inch,” Ng said. Today, 95% of the world’s RF SOI chips are built in 200mm fabs. GlobalFoundries, TowerJazz, UMC, Sony, SMIC, TSMC, HHGrace and STMicroelectronics all have 200mm RF SOI fab capacity. The larger foundries are bringing up 300mm RF SOI. GlobalFoundries, TowerJazz, TSMC and UMC are in the 300mm camp. These processes range from 130nm to 45nm. 300mm won’t solve the overall RF SOI capacity crunch, however. 300mm capacity is mainly targeted for high-end 5G systems, with some capacity allocated to today’s 4G phones. Nevertheless, 300mm RF SOI is a requirement for 5G. Initially, 5G networks will be deployed in the sub-6GHz frequency ranges in 2019, with millimeter-wave technology in the works. Integration is the biggest advantage of 300mm. The first wave of 5G phones will have a similar RF front-end architecture as today’s 4G systems. 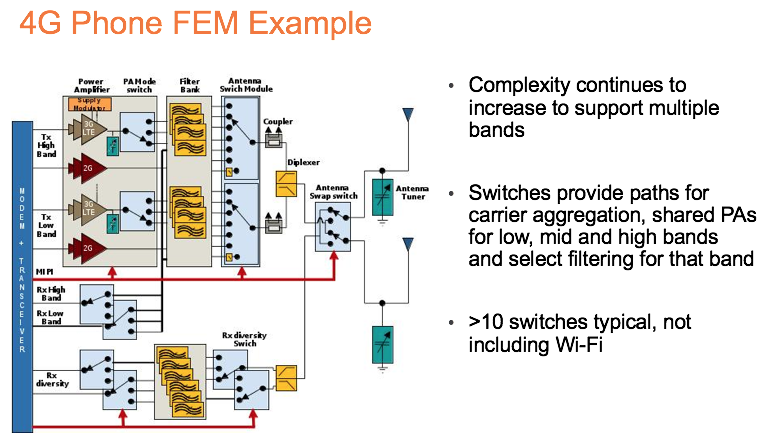 For 5G, though, the big difference is that OEMs want to integrate the separate RF switch and LNA into a single device. Over time, 5G also will operate in the millimeter-wave bands. This involves the band of spectrum between 30 GHz and 300 GHz. 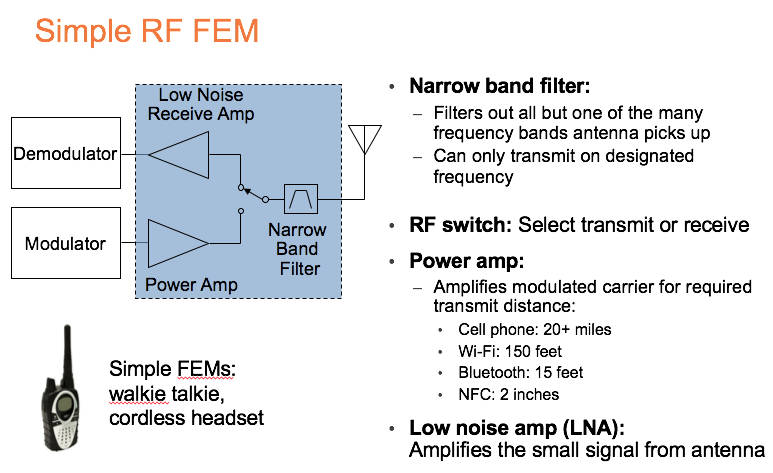 “The RF architecture will need to be modified to cover one of the frequency bands. To achieve this, the RF transceiver will incorporate the IF or the intermediate frequency transceiver and the down converters with a CMOS-based millimeter-wave RF front-end module,” Woo said. “RF content will grow to respond to the increase in RF complexity for 5G handsets. Given the limited space to implement this increasing amount of RF, solution size is a priority. With this, integration will continue to increase, not just for size, but also for performance. Discrete 5G solutions could be seen during trials, but will quickly leap directly to higher order RF front end modules with PA, filtering, switching and LNA functionality included,” said Ben Thomas, director of mobile 5G business development at Qorvo. ”When we go to 5G, there will potentially be more bands depending upon the region, such as n77, n78 and/or 79, which will be deployed in different combinations across the globe. 5G handsets will utilize more complex tuning and antenna-plexing to manage the complex nature of dual uplink and increased MIMO configurations, all aimed at increasing data speeds. All of this combined with a multi-fold increase in CA combinations leads to more antenna tuning, more complex filtering, more switching and more RF front end modules which combine these functions with power amplifiers. In short, more RF everything is needed to deliver the 5G promise of more data,” Thomas said. Meanwhile, foundries are expanding their RF SOI capacities. GlobalFoundries, the leader in RF SOI, is ramping up 300mm RF SOI in two fabs–East Fishkill, N.Y. and Singapore. The processes include 130nm and 45nm. For some time, GlobalFoundries has been running 200mm RF SOI in two fabs–Burlington, Vt. and Singapore. “It’s a priority to invest up and down the chain. We are also investing in 200mm capacity,” GlobalFoundries’ Bastani said. TowerJazz, meanwhile, has been shipping 200mm RF SOI for some time. The company is ramping up 300mm RF SOI in its fab in Japan. The process is based on 65nm, although the fab is capable of 45nm. Both UMC and TSMC have been shipping 200mm RF SOI for some time with plans to enter the 300mm race. For many years the SOI market was in a doldrums so looks like finally there is an action. Obviously if the demand for SOI wafers will increase than we will need more suppliers than just SOITECH that have been struggling forever. Also the big question is would the FD-SOI in the digital world will ever grow or will stay as a niche market.